Four-year member of the Sultans of Stats (/r/SultansOfStats) Champion's league and two-time winner (‘16, ‘18). Overall champion (#1 on leaderboard) of 2014 /r/SultansOfStats league. Beat FanGraphs’ writer Paul Sporer, who failed to make good on his bet, and thus will remain listed here for the sole purpose of shaming him. Fervent consumer of all things fantasy baseball. Architect of overly complicated Excel spreadsheets. I do science and engineering in my spare time. Hopefully I can provide some useful fantasy advice along the way! To make the mascot drink of this site, similar to a Harvey Wallbanger you will combine 6 parts orange juice, 3 parts vodka, 1 part galliano poured over ice. Then chug the entire drink and smash the glass against the nearest wall. Bonus points if you call someone a clown and tear your UCL while doing it. Or get choked out by a friend/teammate. Do these references even track anymore? Do you all remember when Bryce crashed his entire body into an outfield wall for no apparent reason? Or when Papelbon committed a literal crime against him in the Nats dugout? 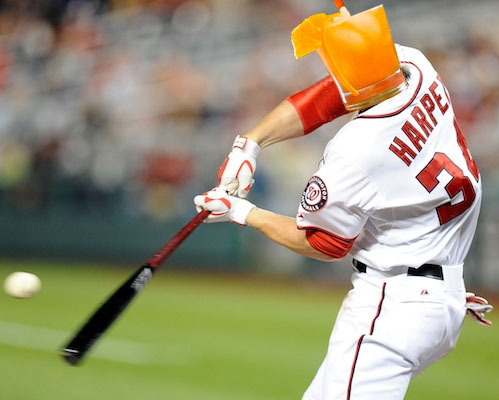 This site is home of the Harper Wallbanger fantasy baseball blog, which occasionally dispenses bits 'o baseball wisdom, as well as the Big Board fantasy baseball player value calculator! Like what I do here? Feel free to donate to keep the site going! Selected by BlogSpot as a Top 30 Fantasy Baseball Blog!